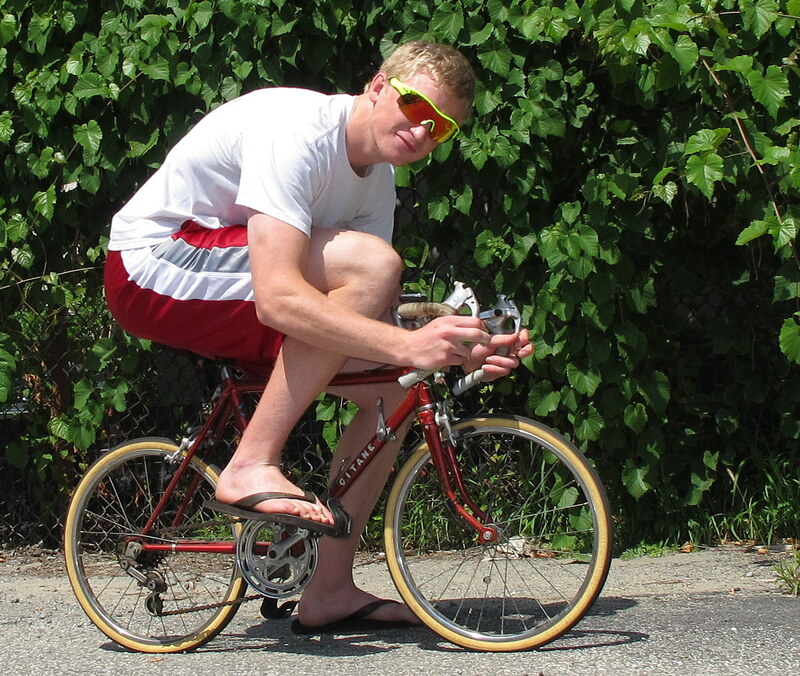 The Flamboyant Introvert: Buying a good used bike from Craigslist. For my first post on this new blogger account, I'm going to write a guide to how to select a decent used bicycle. Even before I introduce this new blog website of mine, which is taking the place of my old MySpace blog (remember MySpace?) and the free blog that came with my businesses web domain hosting (with its character limit). My second post here will introduce it a little more thoroughly than these three sentences, and after that I will start moving old existing content here. But first I will take a break from my usual political ranting, personal stories, and posting of links I found fascinating, to fulfill a promise I made to a fellow reader of a different blog (one with actual readership, MMM) in the comment section to share some of my knowledge of bikes and of Craigslist for an audience that may not know a good bike from a bad one. Imagine that, something useful! I began riding regularly for fun and transportation in 1992, when I was 12. The next year I began riding to school every day, so that I could keep the bus money for other things. In high school, in addition to daily commuting (to school and internship) and weekend rides of 40-100 miles, I began annual 4 day trips down the CA coast with a group of teachers and friends. After college I went with the couple that had organized those annual rides from San Francisco to Puerto Vallarta Mexico, and went solo from there along the coast to Acapulco and then North to Mexico city (over an 8000ft pass) for a total of 2800 miles over 2 months. When I returned, I took a job as a bicycle messenger. I eventually ended up also working as a messenger in New York City. In 20 years of serious riding, I have had a bmx bike, a steel touring bike, a British internal-hub drop-frame from the late 60s, a carbon fiber racing bike, an aluminum mountain bike, and two folding bikes, all of which together I paid a grand total of $450 for (of which $400 was the carbon fiber road bike). Eventually I returned to CA where, for the past 6 years, my primary job has been as a hauler (mover, and handyman) which involves picking stuff up that people don't want anymore, and then finding new owners for those things. This involves either selling or giving away anything which is still useable (which is most of what I pick up), frequently on Craigslist. My second job for the past 5 years has been as a mechanic in a tiny bike-shop of sorts, the Bike Station, whose primary service is FREE secure valet attended bicycle parking, but also offers relatively low-cost repairs. Because we don't sell new bikes, and because we never turn anyone away for lack of bike quality, I have been able to work on a great variety of bikes, of all types and ages and cost levels, which is rare in any one shop. And now... on to the content! DO NOT BUY A DEPARTMENT STORE / TOY STORE BIKE!!!!!!!!!!!!!!!!!!!!!! Ever. Don't even consider it. Seriously. Not even for your kid. They are absolute garbage. They shouldn't be legal to ride on public streets. They should be considered toys at best. This includes pretty much anything you can buy at WalMart, Target, or Toys'R'Us, or whatever local equivalent you may have where you live. The most common brands are Magna and Next (both Dynacraft company), Pacific, Roadmaster, Huffy and Murray (all Dorel Company), . One of these bikes brand new is worth less than a real bike that is 30 years old. (Actually, my favorite bike, the one that I rode to Mexico and used a messenger is almost 40 years old). Only slightly better are most modern Mongoose, Schwinn, Ironhorse and GT. All of these made decent bikes in the 80s and 90s, but were then bought by Dorel and quality dropped. Not all of these bikes are department store quality - my own mountain bike is a GT - but if you aren't confident at telling the difference, it may be safer to avoid all of these brands (or find a friend who can). The same company also owns Cannondale, but unlike with their other brands, Cannondale never made department store bikes. Schwinn has recently begun producing decent entry level bikes again as of 2014, but they had about a ten year run of only making department store quality bikes. I can not emphasize this enough. Having worked on department store bikes many years, I can say with absolute certainty that they are not worth the price if you are given one for free. They use the cheapest parts that can be found, parts which have been obsolete for decades in the rest of the bike world, and those parts are put together by people who know literally nothing about bike mechanics. I have rarely seen one, even brand new, that had everything adjusted properly. They are so cheaply made, and so poorly assembled, that they are dangerous. The best clue that the bike you are looking at is a department store bike is if it has a one piece crank. 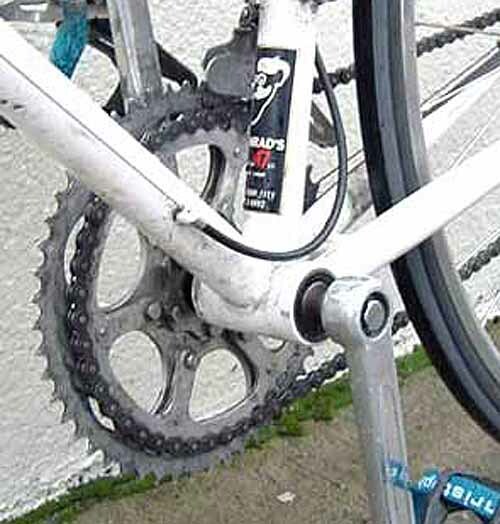 Notice how the crank arm bends where it meets the bike frame, and goes straight into the bottom bracket. 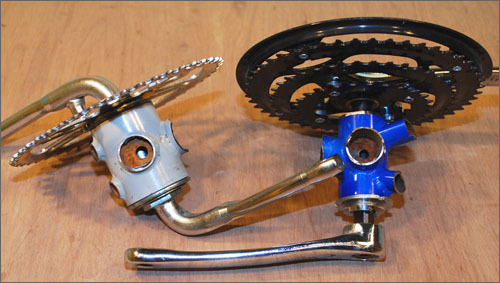 Notice that in this one, the crank arm is straight, and it is bolted to the axle. Note that most road bikes will have compound caliper brakes, which are similar in shape, but slightly more complex. The keys to the crappy brakes are the rectangle brake pads and the flat metal brake arms, with just one single pivot point in the center. Note also that occasionally older bikes may have simple caliper brakes (though they won't have flat brake arms or square pads), and it doesn't necessarily mean the bike is crap. If a bike less than 30 years old has them, stay away. Unfortunately, many department store bikes less than 5 years old often have slightly better components - 3 piece cranks and direct pull brakes - so it is slightly more challenging to recognize them at a glance, other than by brand. Now that all that is out of the way, lets get into what you should look for. But wait, no, before we get to that, you have to establish just what it is you are looking for. Like in everything else in life, every choice you make is a series of tradeoffs. There are a lot of different kinds of bikes, that are good for different kinds of things. You can use pretty much any bike for anything, but some will make the trip a lot easier. Will I want to carry a lot of stuff with me? Are the local roads well paved, and/or will I ever want to venture on trails? Will I have to climb any steep hills and/or pull a trailer? Will I ever ride in rain/snow? Will I be working up to high mileage sometime in the future? Some bikes - especially ones specifically intended for casual riders or for commuting have the gears hidden inside the wheel. This has the advantage of being cleaner and simpler for the user, because all moving parts are hidden. They are also less prone to being broken and are more weather resistant for the same reason. The trade off is that they are more expensive (to buy and to repair), heavier, and the lowest gear of an internal system will not be as low as with external gears. For this reason, if you have to ride up steep hills, go with external gears. If you ride mostly flat or only small hills, its a matter of preference. For inclement weather, a mountain bike, hybrid, or purpose built commuting bike will outperform most road bikes - although you can put fenders and lights on anything, you can't put wide tires on a racer. This is especially true for snow. Just like with a Cadillac and a Geo Metro, there is a trade off between comfort and efficiency. Beginners often get a bike with a wide saddle and tall handle bars, so they can sit up-right like a big rolling sofa, and then get discouraged when all the cool kids on real bikes pass them by at twice their speed everyday. Its not just that they are weak - there is a reason racers have low handlebars: the biggest factor in bicycle efficiency is wind resistance, and when you are upright, your torso is like a big parachute. So that comfort comes at the cost of twice as much effort to go the same speed. On the same note, a mid-range hybrid or mountain bike can weigh more than twice as much as a high-end road bike, which is a lot of extra pounds to lug with you up the hill to your house at the end of the day. None of that is to say don't buy the hybrid, just understand that there are trade-offs. They are trying to be decent at everything at once, without costing much and making new riders comfortable, which means they excel at nothing. The best compromise, in my opinion, between efficiency, bad road/trail worthiness, and bad weather capability, is a cyclo-cross bike, which is a road bike meant to be used off-road, however they are somewhat hard to find, and therefore usually expensive. The next best all-around option, (again, in my personal opinion) which also includes cargo hauling capacity built in, is a road touring bike (which would be why that's been my primary bike for the last 2 decades). But that isn't to say that you can't have a perfectly good long-term commuting experience with a mountain bike, racing bike, hybrid, cruiser, or a 60 year old bike from before special purpose bikes existed. If it's possible, I'd recommend seeing if you have any friends with various types of bikes you can borrow for at least one ride, to see how they differ in riding position, gearing, handling, and so on. If nothing else, maybe you can find a local bike shop and do a test ride on a couple of different bikes. You may be taking advantage of them even more in the next step (since you will ultimately buy used directly from someone), but to make up for wasting their time, plan on buying all your accessories (minimum: helmet, lights, gloves, bell) from them, and/or having them do a basic check/tune of your new (used) bike once you get it. The only way to really get it exactly perfect in every way is to go to a bike shop and find someone who really knows all the variables, preferably with access to an adjustable bike fit machine (a stationary bike where you can change the lengths and angles of all the components and frame parts). They often don't charge for this if you are planning to buy a bike from them, but again, if you go for a bike fitting, and don't buy a bike from that shop, you should really buy your accessories and/or service from them. Bike shops operate with a pretty small margin. Given that you are looking to buy a bike used, and not get a frame custom built to your specifications, knowing your perfect fitment doesn't really matter anyway. As a super quick and simple rule of thumb, when you stand over a bike frame (in front of the saddle) with your shoes on and feet flat on the ground, there should be at least 1 inch, preferably 3 or 4, between the top tube and the beginning of your... special parts. For one thing, if you were to be in a minor crash and fall forward off the saddle, you don't want to be impacting a big steel (or aluminum, or carbon) bar of bike frame. This is also an indication that the frame more or less fits you. If, when you straddle the bike, the top tube is actually touching you, that bike is much too big for you, and no matter how much you love it and no matter how good the price is, it just isn't the bike for you. I'm sorry. On the opposite end, you can use the seatpost to judge if a bike is too big. When you ride, your knees should be 99% of the way straight at the bottom of each pedal stroke (not 100%, or locked-out, but almost). If you don't extend your legs all the way, (imagine how it looks when an adult rides a tricycle meant for kids), you will end up hurting your knees. In fact, if you have ever had hurting knees from riding a bike, this is the most likely reason. Your seat was too low. The seat post (the part that attaches the saddle to the frame) should have a line on it marking the maximum its meant to be extended (it may or may not say words to that effect). 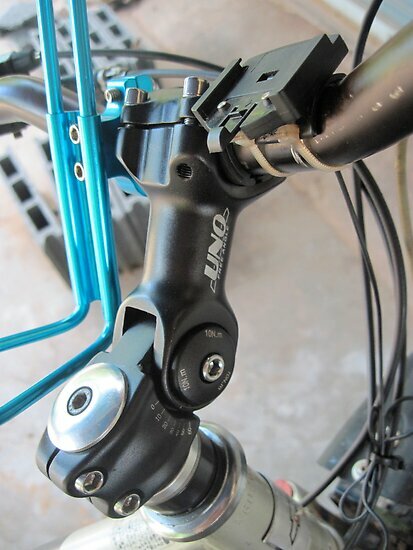 By loosing a screw, bolt, or quick release lever at the place where the frame clamps the post, you can raise or lower the seat height. If the post is at its highest (at the line) and when you ride the bike your legs are not extending fully, then the bike is probably too small for you. You can always buy a slightly longer seatpost if it's close, but if the seat needs to be higher than about 10 inches above the frame (assuming the top tube of the bike frame is horizontal, more on that soon), chances are the rest of the dimensions are too small for you anyway. Of course, many bikes don't have a straight horizontal top tube running from the handlebars to the seat. The sloping top-tube or the drop-frame that used to indicate "girl's bike" (in order that the bike could be ridden in a skirt or dress) has become common on mountain bikes and commute oriented bikes and many hybrids for both genders, as well as continuing to be common for female specific road bikes. With a sloping top tube you can't just stand over it and measure the distance between your body and the frame to determine fit, and the seat-post will have to be extra long. In that case you just draw an imaginary line (or better yet, use a level and some string or a broomstick or something) where the top tube would be if it went straight across. There is really a lot more to it than that, (such as the length of the top tube and the angle of the seat tube) but to keep things simple, 1-5 inches between you and the bike frame (or where the frame would be if it were straight) with your feet flat on the ground is about the best approximation there is. Once you find one bike that fits, you can check the frame size (usually printed on the seat tube) and have a rough idea of what other bikes will also fit you - generally mountain bikes and hybrids will be measured in inches, road bikes in centimeters. But be aware that the numbers can vary between bike styles, brands, ages and depending on whether the top tube is horizontal or not. So now you have some idea of what kind of bike you are looking for, and what size it needs to be. There are hundreds of brands, with even more choices in components, so it is impossible to recommend any specifics, or break down all of the possible combinations. They all have high-end and low-end stuff, so never assume a bike is good or bad just based on the brand of the frame or the components. Older bikes can be very good quality, just try to stay mostly on this side of the 80s, when most manufacturers switched from carbon steel or high-tensile (Hi-Ten) steel to chromoly (ChroMo) steel. The only modern bikes that still use carbon steel or hi-ten are the department store bikes, but pre-80s they were the standard for all but the most high-end bikes. Some of the more high end older bikes did have good steel frames, particularly those made of Reynolds 531 or Columbus steel. If you can find one, in good condition, you are looking at a good frame even though it is older. However, unless the prior owner kept up with upgrades throughout the years, you should still consider a newer bike, as many advancements in components have been made since then. [UPDATE 2014]: Apparently Schwinn has started making real bikes again. If it has a sticker (usually on the seat tube, near the frame size sticker) that tells frame material, avoid high tensile steel. Cromo steel, aluminum, titanium, and carbon fiber are all good frame materials, with their own pluses and minuses, but for practical commuting purposes, you should mostly be looking for steel. Aluminum is also decent, and usually a little lighter. I prefer steel for a practical commute style bike, because it is the strongest of all frame materials, and it can be bent back after a crash and keep going. Any other frame type, once damaged or bent, is no longer safe to ride. However, if you find a bike that is perfect in every other way, don't necessarily shun it just because it is made of a more exotic material. Suspension adds weight, complexity, and cost, and unless you ride off-road, doesn't serve much purpose, but if you do ride-off road, (or have giant and frequent pot-holes to contend with), it can make the ride more comfortable and give you better control. In general, for a commute bike, I would recommend skipping it. Skinny, high pressure tires have less rolling resistance and less weight, therefore you can go faster / further with the same amount of effort. However they have less grip in bad conditions (esp mud or snow), give a bumpier ride, and are (in theory**) more prone to flats. ** In my personal experience, I have not had any more flats on my road bikes. The curved style of handlebar found on road bikes gives you more possible hand positions, which can be nice on long rides once your hands get tired, but ultimately handlebar shape is a matter of personal preference. If possible, try a couple different styles out on the open road before becoming committed to any one type. On the left is the traditional adjustable height stem. To change the height, you loosen the hex bolt in the center, twist the bars a little to break the connection, and pull them up. Don't go higher than the marked limit line. On the right is the newer (threadless headset) which has limited to no height adjustability. Sometimes you can switch the position of the spacers to get a small height change. As long as this already is, I am deliberately leaving out gobs of information, because this is a basic guide, and because you are buying something used and have limited choices. You aren't custom ordering a $3000 bike, so if you have a hard-core bike fanatic friend, you can safely ignore most of what she tells you about frame butting, spoke counts, gear ratios, or the superiority of Campy parts over Ultegra and Dura-Ace. Remind her that your goal is to get from one place to another, not to win a criterium. Tell her you don't even know what a criterium is. In case you didn't already know, Craigslist is awesome. It is one of the most effective tools combating the worst aspects of the American consumerism cycle in which we are constantly throwing away things that still work in order to buy a slightly newer version, wasting our own money along with massive amounts of natural resources. Craigslist helps recirculate our money in our own communities instead of having it siphoned off by giant soulless corporations, keeps good stuff out of landfill, and prevents material extraction and energy consumption to create new stuff, all by the simple act of bringing together people who have stuff they don't want with people who want stuff they don't have. If you are lucky enough to live in a reasonably large city, with at least a moderate amount of cyclists, than chances are good you can find a large selection of high quality bicycles on your local Craigslist page. If not, though, the same principals apply to buying from a yard sale or flea market. Another option is a used bikeshop. They will generally charge a bit more than buying directly from the previous owner, but you get the advantage of a bike that has been checked out by a mechanic, and a knowledgeable person to help you with the selection process. Expect to spend at least $100, but unless you are lucky, probably $200, possibly more. Yep, that much, for a used bike. Even an old one, or a simple one. Less than that, and the chances are good you are buying a department store bike, a 40 year old bike which was low quality when it was new, or a bike that has been left out in the rain and generally not taken care of . Spending less will likely mean that you have to spend much more in parts and service in order to get it up to decent operating condition. If a bike is decent quality, well taken care of, and severely underpriced, it may well be stolen. Don't support bike thieves. They will end up stealing the bike back from you again. That's called Karma. A decent new bike from a bike shop is generally $600 and up, so you are still saving plenty of cash by spending $200. Of course you can always get lucky and find someone who has no idea what they have is actually worth (like I did with my $400 carbon fiber racing bike), but don't expect it. At the same time, be aware that there are a great many over-priced bikes on Craigslist. Depending on your market, it may take some patience to find a good one. Do a Google search of the make and model of any bike you are considering. In general, look for bikes no more than 20 years old, and of course, avoid department store bikes like the plague. So say you have read this far, determined what you need, figured out the size, and browsed around and found a few ads that seem to have good quality bikes. Keep in mind that someone is selling the bike for a reason. More often than not, the reason is because they just never ride it. Which usually means it hasn't had any maintenance in... ever. If its been stored indoors where it is dry, that may not be a problem, but in a damp basement or a back porch, there is likely internal rust that you can't see. If you see rust on the outside, unless the person is a bike enthusiast that you trust maintained the bike, assume there is internal rust as well. A bike bought by someone who never got around to riding it is more likely to have been cheap to begin with and to not have had much care taken in its purchase. These are obviously not hard and fast rules, but if they are selling due to a move out of state, or due to having several other bikes, the chances are a little better the bike was taken care of. Take hold of the wheels, and try to move them side to side (perpendicular to the way they turn). There shouldn't be any play in them side-to-side, against the axle. Do the same for the cranks (what the pedal attaches to) and the handlebars, trying to wobble them side-to-side, not the way they are supposed to turn. If they are loose and wobbly, that is a sign the bike hasn't been taken care of. Those things are easily tightened (although some require specialized bike tools) but if they have been ridden loose, they are likely to need more extensive repairs. Spin the wheels while holding the bike off the ground, and watch how the rim moves relative to the brake pads. If the rim moves so much that it hits the brakes on every revolution, this is usually repairable (by "truing" the wheel - adjusting the tightness of each spoke) but it is another sign of a bike that wasn't maintained. Avoid a bike with any obvious dents or cracks anywhere in the frame. If a bike has been in a severe crash, there may be more damage than meets the eye. I've had a frame suddenly break on me. It isn't pretty. Tires and handlebar tape can be replaced, and a bad paint job can discourage theft, so try not to let the aesthetic elements overwhelm the mechanical ones. Expect a test ride, but offer to leave something with the seller (like your ID) so they know you don't ride off with it, since it is essentially its own built-in getaway vehicle. Once you have (FINALLY) found a good bike that fits your needs, its time to make the deal. Because this is Craigslist, don't forget you can try to negotiate. But don't be a jerk about it. Don't show up and then at the last minute claim you "only have $100" as though you forgot the asking price. If the person refuses to provide their name, or seems hesitant to have you check the serial number, there is a good chance the bike is stolen, and you should politely move on. Having a receipt will also be useful in recovering the bike should it ever get stolen from you, or in having insurance replace it if it isn't recovered. It's a good idea to have it checked out by a qualified mechanic, or at least a friend who is a bike nut. This is a perfect opportunity to pay back the local bike shop that helped you out with advice while you were shopping. If there isn't a local bike shop around that you owe a favor to, Bike Nashbar offers some of the lowest prices you can find anywhere on bike accessories. While you are there, you need, at a bare minimum, a new helmet. Don't use a helmet that came with the bike, or any other used helmet. They get internal damage from absorbing the energy in a crash, which may not be visible from the outside (it is basically a bundle of microscopic bubble wrap, and in an impact, the little air bubbles pop). Therefor, a bike helmet is one-time use only. If it is used, there is no way to be sure it hasn't been in a crash already. Even if it hasn't been in a crash, repeated drops, even just from 4ft up to the ground, can gradually wear away its impact protection, as can UV exposure from the sun and ozone exposure from traffic. If you ride at night, a headlight is absolutely essential, along with the reflectors that come standard (or reflective tape if someone removed the standard reflectors). Even better is an extra bright headlight, a tail light, the standard reflectors AND reflective tape. Run the headlight even when it is light out anytime there is reduced visibility, such as when there is sun glare at dusk and dawn, or on an overcast day. I've noticed I can see cyclists better when I am driving when they leave their headlights on in daytime, therefore I now run my lights ANY time I'm on the bike, day or night, even when its clear out. Getting hit by cars is not fun. Other very good things to have are gloves, which absorb road bumps and protect your hands in a fall, and a bell to warn pedestrians without having to yell. Some people swear by cycling shorts, which have a pad built in to supposedly make sitting more comfortable. I have never cared for them. More important is to get a saddle that fits you properly. It should be slightly wider than the distance between your "sit" bones - you can feel them protruding at the bottom of your pelvic bone when you squat. Measure that distance (preferably at home alone) and look for a saddle no more than an inch or two wider than that (and definitely no narrower than that). Having that distance correct will make more of a difference than any cut-outs or gel inserts or shock absorbers or any other gizmos and "features" you find on modern saddles. The saddle should be firm. This will feel more uncomfortable at first, but as you get used to it, and you put more miles on the bike, it will be more comfortable (and do less potential damage to important body parts) than a squishy saddle. The reason is because you sink down into a soft saddle, and it puts pressure on all parts equally, while a hard saddle supports the sit bones only, keeping everything else above it, like it should. I know the big wide cushy gel seat seems like riding an easy chair. You just have to trust me. The reason I put this under the accessories section, and not the components, is because saddle selection varies so widely, both by gender and among individuals, that you shouldn't expect to find a bike that has a comfortable saddle for you already in place. You might get lucky, but don't reject an otherwise good bike because the seat is uncomfortable. If possible, try to find a shop that will let you trade, if the one on your bike is in good shape, but just not right for you. A bicycle is considered a vehicle, and as such, they are required to follow the same traffic laws that cars do. Ride on the right side of the street. Stay off of the sidewalk (unless expressly allowed in a particular location). Stop at red lights. Stop at stop signs***. Ride predictably and signal your turns when warranted. The majority of bike/car collisions are partially or entirely the cyclists' fault. Two of the most common causes of crashes are bike riders riding on the sidewalk, and bike riders riding the wrong way (on the left side of the road). Another common cause is lack of visibility on the part of the cyclist. Eliminating these few (totally controllable) factors actually makes riding a bike statistically safer than driving a car. The thing most new cyclists worry about - getting clipped from the rear by passing cars - is actually relatively rare. Crashes happen primarily at driveways and intersections, and they happen because the cyclist was somewhere the driver didn't expect them to be. If not, check with your local shops, riding clubs, or bicycle coalition to see if anyone offers something similar. UPDATE: I just wrote a new post specifically for new riders who aren't used to being in traffic, to help you avoid getting hit by a car. This post has been way more popular than I ever expected, and since it is intended for new riders, I thought it would be pretty important to help y'all not only pick out a new bike, but not get run over while you are riding it! *** I won't pretend I stop at stop signs, or even try to convince you to. But at least slow down for them, and look both ways before you cross. And always come to a full stop if there is cross traffic which has the legal right of way. brings back memories of "back in the day"
Excellent ! Just what I needed to figure out my first commute bike purchase. Craigslist bike ads is also a great place to get a laugh. 20-year-old craptastic K-mart bike listed as "vintage bike" for $250, email for pitures .... stuff like that. good point. I should specifically make a note about that. Good post, Bakari! There's a few points that I would quibble with, but I like most of what you say here. One thing to suggest for those who might not want to deal with Craigslist but still want a less expensive than new bike: a bike shop that specializes in used bikes and parts. The bikes sold here will be more than what one would pay for on CL, but they've been gone over by a mechanic and should be in good working order. And many of them come with a warranty. Good point, I will mention it in the blog post. Hello Bakari. Thanks for writing. I came across your blog when someone on facebook linked to it. I think it was someone from QBP, if I recall accurately. 1. Fitting: the adjustable fit bike, or any proprietary fitting system is generally not necessary to get a decent fit, and most of the time, shops that have this equipment charge at least $100 for the service. As an experienced bike person, I can usually eyeball a person on a bike and make the necessary fit adjustments. Usually some subsequent trial-and-error will be required, but that's also the case for the expensive fitting systems. 2. Some of the older hi-ten steel bikes are ok, provided the parts are decent, the fit is good, and the bike meets the owner's needs. A "fancy" CrMo frame from yesteryear may be more race-oriented, and less commuter-oriented. 3. Clipless pedal efficiency: except for 110% sprinting efforts and storming up hills and highly technical offroad riding, I believe the alleged efficiency of clipless (or clips/straps) is mostly hype. If you use clipless for awhile, then try platforms, it feels like you can't keep your feet on the pedals. I believe this is where people get the idea that platform pedals are inefficient, but the inefficient part is the sloppy muscle memory that has been learned. I gave up on clipless years ago, and ride platforms exclusively. If I'm slow, the pedals are not the reason. 4. Nashbar and other online bargain places sometimes have good deals, but often they have artificially discounts on inflated "regular" prices, to make it look like something priced at MSRP is a closeout. Furthermore, it's VERY easy for an inexperienced bike person to buy things that aren't appropriate, or are incompatible with existing gear. Much better to buy from the local bike shop, where a knowledgeable person can generally offer real-world advice, and customer service after the sale. As often as not, if Nashbar is selling something at a discount, the LBS can sell it at a discount, too. It doesn't hurt to ask for a price-match, but like I said above, often Nashbar's "deals" aren't really deals. This assumes you have a LBS you can trust. If your LBS doesn't meet your needs in some way, that's another story. Its comments like that which make the amount of time I spent on writing it worth it. Over the top great post! P.S. just bought a 2012 Fit Sport automatic and am hypermiling it, got 37.5 mpg last tank! I'm a fan, Bakari, keep up the great work! Thank you so much for writing this. I do have one question... I currently have 3 bikes - a road bike, a mountain bike, and a hybrid bike. I'd like to get down to 2 bikes. I think I'll always want a mountain bike, because riding mountains and trails is my favorite kind of "fun riding." But now I need to figure out what kind of bike should be my second bike. I'm not that into riding roads for fun (besides, bike lanes are not consistent around my town) and potholes are a problem - so I think a road bike is not my ideal second bike. I do a lot of curb-hopping and short-cutting through rocks and grass, and my hybrid seems to have taken it's toll. The wheels are constantly untrue despite constantly trying to true them, and I'm pretty sure the frame isn't going to hold up forever. So for my basic road/sidewalk/grass/rock commuting to work, grocery, library, etc. I've been using my mountain bike, but I feel like it's a lot of wasted energy due to the high wheel resistance, low set gears, and heavy frame. Based on your description, it sounds like a road touring bike might be a good second bike option - would you agree based on my description of my riding? It sounds like that's worked well for you... (and my follow up question would be for a recommendation of brands to consider and/or avoid as I search on Craigslist). Personally, I have absolutely loved using a road touring bike for exactly the scenario you describe. But a lightweight cross-country mountainbike with road tires could do just as well, and a lot of people would recommend that. A cyclocross bike (a road bike meant to be used off-road) could also be a good choice, although they are harder to find (and so usually more expensive). Just wondering why many bikes don't have a straight horizontal top tube running from the handlebars to the seat. Anyway,will certainly visit your site more often now. It gives more stand-over clearance between the riders special bits and the solid metal bar with the same size frame if the top tube slopes downward from the headtube to the seattube. I book marked this link. I'm not in the market for a bike right now but I've been considering some options. Thanks for the post. After reading this article and searching on craigslist for two weeks I scored a 1998 Gary Fisher "Big Sur" for $140. I don't know much about bikes, but it appears that the bike MSRP was $900 in 98. It's in pretty good shape, other than the fact that I can't get the seat to move up or down. I wanted a Mountain Bike, but I wanted a lighter frame. This one weighs in at 21.78 lbs so I'm thinking for the price I got a pretty great deal? How'd I do? and coat it with grease before you reinstall it. Thanks for the heads up. I've got my bike upside down right now with some ammonia (windex) and some lubricant in the seat tube. Hopefully I'll be able to get it moving in a bit. I agree with most of this excellent article, but I mildly disagree on two points. 1. Pedals. I don't agree with using clipless for transportational cycling. There's little difference in speed, or trip times, but a "clip 'n strap style" pedal with sneakers is much easier to deal with at stops if you don't have the strap cinched down too tight. When I put my cycling cleat down at a stop, I feel like I'm dancing on ice. And starting from a stop with clipless is a slow, wobbly, hang-on-while-I-get-clipped-in affair. I still use clipless if I'm riding in a group, and may need to sprint, or maintain a steady pace in a paceline, but otherwise, I'll use my "clip 'n strap style" pedals. And if I ever have to walk any significant distance, I'd MUCH rather be in sneakers. 2. Lights. Dedicated cycling lights don't hold a candle (ha, ha) to the latest crop of LED flashlights in terms of lumens per dollar. There's MUCH more competition in the flashlight market. I'm in the process of upgrading my headlight, and I've found several flashlights already that I favor over the latest crop of bike lights. And when I finally pull the trigger and upgrade, I'll have a bright flashlight too. Actually, two. Flashlights are cheap enough that I'm going to go with two for redundancy. BTW, good advice on the reflectors. It boggles my mind when roadies try to save 2oz of weight by removing all the reflectors. I've come up on kids in a subdivision at dusk riding with no lights, but I immediately recognized the presence of bikes by just the pedal reflectors. Thanks for the feedback, Billy. It sounds like you and I have used VERY different pedal systems. I've only ever used SPD, so thats all I can really comment on. I used clips n straps for about 4 years, daily, for commuting, so I got very comfortable with them. Every time you start from a stand still, you have to physically rotate the pedal, then slide your foot forward. It was always a "slow, wobbly, hang-on-while-I-get-clipped-in affair"! 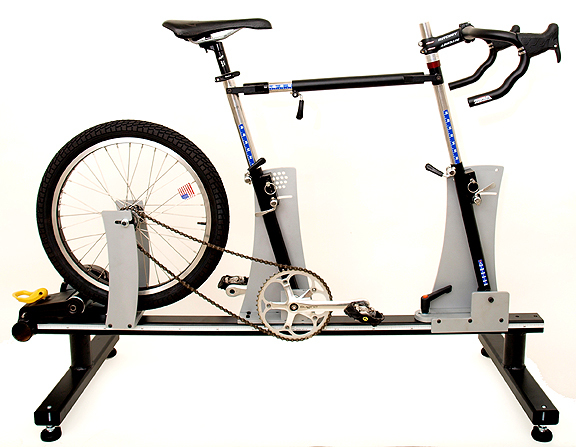 With double sided spds, you just start pedaling. Either you clip in without even trying, or you get up to speed without clipping in. All you do is find the right spot, and press down. And the cleat is recessed into the shoe, so you are walking on rubber, just like a sneaker. I'm guessing you have a look system, or something similar, and while I haven't used it, I imagine it would be more like you describe. I need to add one thing that I've found as far as pedals go. I only wear Vibrams so it's difficult for me to get a pair of the clip n' straps adjusted correctly, to where I can get good upward strength transfer. Power Grips are just a piece of canvas that mount to a standard platform. Uber-adjustable, and as long as you do it right, you get almost as much benefit as SPDs...without a huge investment. Thank you for this wonderful article. I have a couple of links that I send to anyone who expresses an interest in commuting by bike or just running an occasional errand by bike. 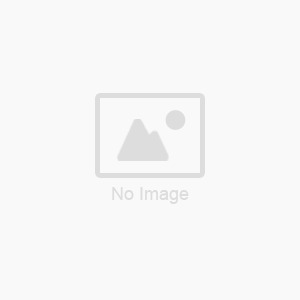 This is a link to a 3000 Lumen light that sells for around $50 and the second link is to a mount to attach it to your handlebars. I hear this is amazing. It's what I'd buy next as far as a front lighting kit. This is the best article I have ever seen about tail lights. Thank you so much for the article. It was very informative and i will definitely refer to it when i see a prospective used bike. I had a next the only thing it was good for was endo since the breaks were so bad! Then I got a good bike a specialized rockhopper and attempted a stoppie boy was I sorry I do my own stunts ouch. I just purchased a 2000 Fuji MTB paid 265 a bit high but it is real nice. Thanks. Is the Fuji suncrest decent it is sure happening looking IMO great components. Wow, thanks for this resource! My workplace is too far from my home to commute by bicycle, but I want to pick up a used one for getting some outdoor exercise in the warmer months. I had some sticker shock when I looked at cycling websites - most of the "entry-level" bikes they recommend are one to two thousand dollars. My budget is more like one to two hundred, so it's reassuring to hear that that's reasonable. I'll probably go to a bike shop next week and see what fits me, because I haven't ridden since I was a teenager who didn't have a driver's license, but did have a Huffy. It was an overweight toy with dodgy gear action, but it got me to the library and back just fine. That's great information. Thanks for sharing this blog. I did a search and found your blog and glowing review. It's been a big help.Thanks fro sharing. It’s a very useful post. thanks for the efforts. Such a very much helpful post for every bike lover. I know, most of the time we need to buy recondition bikes and it's really hard to recognize the quality of a bike. After reading this post, a buyer can solve this problem. I think so. I tried a few years ago to find a nice commuter (searching Craigslist and visiting the LBS), but at 6'8 custom seemed to be my only option. Any advice for getting a good fitting bike at this height that doesn't end up costing me thousands? I am searching Craigslist for a road-touring bike as you mentioned above, what should I type into the search ? Are there any other search words that a road-touring bike would go by ? I've keyed in "road touring", "road/touring" and it brings back about 10 hits and I am not sure if they are right. I have been out of the riding community for years now. I am trying to get back in this summer. Thank you for the information. It has been very helpful. Road touring bikes aren't that common or popular. When someone buys one, its usually an enthusiast, and they aren't likely to sell it. So it is a challenge. Finding around 10 or so seems about right. However, some people might have one, and not know the right terms to use to list it. If I were looking, I'd do separate searches, one with just key work "road" and another with keyword "touring" and just comb through them by hand. Got to your site from the MMM site and have followed read some of your blog postings and I really like this one in particular. In getting more used to the bicycle, I recently purchased a bicycle from a LBS with the front and rear lights and also the helmet. But I have a question about choosing the right seat as the one that came with the bike seem to be giving me discomfort(more like the whole groin area feels numb). Hope you can help me out on choosing a bike seat. ps. Is there anyway to contact you/reach out to you? Hi. You may have missed the section where I talk about this. Use the "find" feature of the browser to look for this phrase on this page: "More important is to get a saddle that fits you properly". Feel free to ask a more specific question if you still have some. My email is one of my internet persona's name's: Lenard Elroy Simpleton - except without the middle name, and with no space between first and last name, followed by the symbol for "at", followed by one of the most popular free browser based email servers, which happens to be owned by the same company that hosts this blog, as well as most internet searches. Thank you, so much great info!! Can I get a recommendation for a cheapish ($250 or less) bike and car rack? I would ride it only on well-paved areas and groomed grass occasionally. I need something to ride around campus. I don't understand your question. Are you looking for a bike, or a car rack? Which one were you hoping to spend 250 or less on? In any event, the answer to whatever your question is is no. There are just far too many variables, and far too many brands, and far too many prices that people are willing to accept for used stuff, to make any specific recommendation. The purpose of this guide is to help you learn what to look for, so you can decide for yourself if any particular thing you find is a good fit for you. I feel like such a scrub. What is wrong with department store bikes? While there may have been some incremental improvements on some areas of department store bikes in the 5 years since I wrote this, I suspect that it is still true that the difference in quality between them and a "real" bike is still significantly larger than the difference in price. Everything from frame materials, to components, to assembly, is done absolutely as cheaply as possible with a department store bike, and this will ultimately result in a poor performing bike that needs more maintenance and repairs, doesn't last as long, and may be hazardous under even normal riding conditions like bad weather, mild off-road, or traffic. first off, not totally familiar with the metric system, and don't feel like doing conversions, so this response is general. They do make extra long seat posts. That may very well help. My mnt bike is 2 sizes too small for me, compensated for with an extra long seat post and a long stem. That said, the frame geometry changes with size, so it affects more than just saddle to pedal length. Even if you saddle is high enough, it is possible to be less than optimally comfortable. Aside from those considerations, if you haven't ridden much, and then you go for a long ride, chances are something will hurt, and it doesn't necessarily mean there is anything wrong with the bike, you could just need more time to adapt. Adding an additional gear to an already multi-gear bike is sometimes simple enough, but going from none at all to 2 or more involves replacing a lot of components (crank and/or hub, chain, derailleur, shifters, grips, possibly brakes). Check with your local bike shop for a second opinion for your specific setup, but unless the bike has a lot of sentimental value, it usually makes more sense to just get the bike that you need rather than trying to modify what you happen to have. On the plus side, if you bought it used, you can probably sell it again for the same price you paid, and then you come out neutral! Ah, uh oh. Yeah, 6ft on a 45cm frame is almost definitely more than any seat post will be able to compensate for!